^ Mars Global Surveyor Measures Water Clouds. [2009-03-07]. ^ Science@NASA, The Case of the Missing Mars Water. [2009-03-07]. ^ Water on Mars: Where is it All?. [2009-03-07]. ^ ["http://www.esa.int/SPECIALS/Mars_Express/SEMYKEX5WRD_0.html Water at Martian south pole] 请检查|url=值 (帮助). 17 March 2004 [29 September 2009]. ^ A numerical model for an alternative origin of Lake Vostok and its exobiological implications for Mars (PDF). [2009-04-08]. ^ 22.0 22.1 Arvidson, R et al. 1989. The Martian surface as Imaged, Sampled, and Analyzed by the Viking Landers. Review of Geophysics:27. 39-60. ^ Hoefen, T. et al. 2003. Discovery of Olivine in the Nili Fossae Region of Mars. Science: 302. 627-630. ^ Zimbelman, J. and L. Griffin. 2010. HiRISE images of yardangs and sinuous ridges in the lower member of the Medusae Fossae Formation, Mars. Icarus: 205. 198-210. ^ Newsom, H. et al. 2010. Inverted channel deposits on the floor of Miyamoto crater, Mars. Icarus: 205. 64-72. ^ Weitz, C. et al. 2010. Mars Reconnaissance Orbiter observations of light-tones layered deposits and associated fluvial landforms on the plateaus adjacent to Vallis Marineris. Icarus:205. 73-102. ^ Fairen, A. et al. 2009. Stability against freezing of aqueous solutions on early Mars. Nature:459. 401-404. ^ Feildman, T. et al. 2004. Global distribution of near-surface hydrogen on Mars. J. Geographical Research: 109. ^ Boynton, W. et al. 2002. Distribution of Hydrogen in the Near Surface of Mars: Evidence for Subsurface Ice Deposits. Science: 297. 81-85. ^ Arvidson, R. et al. 2008. Introduction to special section on the phoenix mission: Landing site characterization experiments, mission overviews, and expected science. J. Geophysical Research: 113. ^ 60.0 60.1 存档副本. [2013-01-04]. （原始内容存档于2012-12-05）. ^ Kreslavsky, M. and J. Head. 2002. Mars: Nature and evolution of young latitude-dependent water-ice-rich mantle. Geophysical Research Letters: 29. ^ Audio Recording of Phoenix Media Telecon for Aug. 5, 2008. Jet Propulsion Laboratory (NASA). August 5, 2008 [2009-07-14]. ^ Amos, Jonathan. Mars robot unearths microbe clue (web). NASA says its robot rover Spirit has made one of its most significant discoveries on the surface of Mars. BBC News. 2007-12-11 [2007-12-12]. ^ Bertster, Guy. Mars Rover Investigates Signs of Steamy Martian Past (Web). Press Release. Jet Propulsion Laboratory, Pasadena, California. 2007-12-10 [2007-12-12]. ^ Opportunity Rover Finds Strong Evidence Meridiani Planum Was Wet. [2006-07-08]. ^ Weitz, C. et al. 2010. Mars Reconnaissance Orbiter observations of light-toned layered deposits and associated fluvial landforms on the plateaus adjacent to Valles Marineris Icarus: 205. 73-102. ^ Head, J. et al. 2003. Recent ice ages on Mars. Nature:426. 797-802. ^ Kolb, K. et al. 2010. Modeling the formation of bright slope deposits associated with gullies in Hale Crater, Mars: Implications for recent liquid water. Icarus: 205. 113-137. ^ 109.0 109.1 109.2 Read, Peter L. and S. R. Lewis,“The Martian Climate Revisited: Atmosphere and Environment of a Desert Planet”, Praxis, Chichester, UK, 2004. 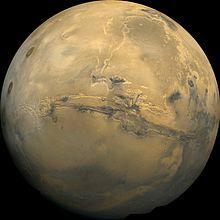 ^ Tang, Y., Q. Chen and Y. Huang, 2006: Early Mars may have had a methanol ocean, Icarus, 181, 88-92. ^ Neal-Jones, Nancy; Zubritsky, Elizabeth; Webster, Guy; Martialay, Mary. Curiosity's SAM Instrument Finds Water and More in Surface Sample. NASA. September 26, 2013 [September 27, 2013]. ^ Webster, Guy; Brown, Dwayne. Science Gains From Diverse Landing Area of Curiosity. NASA. September 26, 2013 [September 27, 2013]. ^ Chang, Kenneth. Hitting Pay Dirt on Mars. New York Times. October 1, 2013 [October 2, 2013]. ^ Milazzo, M. et al. 2009. The discovery of columnar jointing on Mars. Geology: 37. 171-174. ^ Milazzo, M. et al. 2003. The formation of columnar joints on Earth and Mars. Lunar Plant. Sci. Conf. 34 (abstract #2120. ^ Mangold, C. et al. 2004. Evidence for precipitation on Mars from dendritic valleys in the Valles Marineris area. Science: 305. 78-81. ^ Murchie, S. et al. 2009. Compositional evidence for the origin of layered deposits in Valles Marineris, Mars. J. Geophysical Research. submitted fro publication. ^ Weitz, C. et al. 2010. Mars Reconnaissance Orbiter observations of light-toned layered deposits and associated fluvial landforms on the plateaus adjacent to Valles Marineris. Icarus. 205: 73-102. ^ Edgett, E. 2005. The sedimentary rocks of Sinus Meridiani: Five key observations from data acquired by the Mars Global Surveyor and Mars Odyssey orbiters. Mars: 1. 5-58. 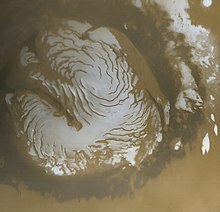 ^ "Water ice in crater at Martian north pole" - July 27, 2005 ESA Press release. URL accessed March 17, 2006. 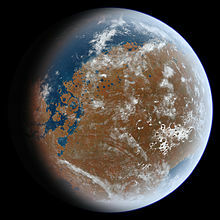 ^ "Ice lake found on the Red Planet" - July 29, 2005 BBC story. URL accessed March 17, 2006. ^ Mars' South Pole Ice Deep and Wide. Jet Propulsion Laboratory (NASA). March 15, 2007 [2009-09-11]. ^ 137.0 137.1 137.2 Water at Martian south pole. European Space Agency (ESA). 17 March 2004 [2009-09-11]. ^ Mars' South Pole Ice Deep and Wide. NASA. March 15, 2007 [2009-09-13]. ^ Lefort, A. et al. 2010. Scaloped terrains in the Peneus and Amphitrites Paterae region of Mars as observed by HiRISE. Icarus: 205. 259-268. ^ Lefort, A. et al. 2010. Scalloped terrains in the Peneus and Amphitrites Paterae region of Mars as observed by HiRISE. Icarus: 205. 259-268. ^ Smith, M.R. et al., "Petrogenesis of the SNC (Shergottites, Nakhlites, Chassignites) Meteorites: Implications for Their Origin From a Large Dynamic Planet, Possibly Mars" - (PDF) Proceedings of the fourteenth Lunar and Planetary Science Conference, Part 2, Journal of Geophysical Research, Vol. 89, Supplement, pp. B612-B630, February 15, 1984. ^ Treiman et al., "Core formation in the Earth and Shergottite Parent Body (SPB):Chemical evidence from basalts" - (PDF) Geochemica et Cosnochimica Acta Vol. 50, pp. 1071-1091 (1986). ^ Bogard, D.D. et al., "Noble gas contents of shergottites and implications for the Martian origin of SNC meteorites" - (PDF) Geochimica et Cosnocimica Acta Vol. 48, pp. 1723-1739 (1984). ^ Treiman, A.H. et al., "The SNC meteorites are from Mars" - Planetary and Space Science, Vol. 48, Iss. 12-14, October 2000, pp. 1213-1230. ^ 155.0 155.1 Treiman, A.H., "The nakhlite meteorites: Augite-rich igneous rocks from Mars" - (PDF) Chemie der Erde 65, p. 203-270, (2005). URL accessed September 8, 2006. ^ McKay, D. et al. 1996. Search for Past Life on Mars: Possible Relic Biogenic Activity in Martian Meteorite AL84001. Science: 273. 924-930. ^ Fassett, C. and J. Head III. 2008. Valley network-fed, open-basin lakes on Mars: Distribution and implications for Noachian surace and subsurface hydrology. Icarus: 198. 37-56. ^ Clifford, S. M. and T. J. Parker, 2001: The Evolution of the Martian Hydrosphere: Implications for the Fate of a Primordial Ocean and the Current State of the Northern Plains, Icarus 154, 40-79. ^ 167.0 167.1 ，Baker, V. R., R. G. Strom, V. C. Gulick, J. S. Kargel, G. Komatsu and V. S. Kale, 1991: Ancient oceans, ice sheets and the hydrological cycle on Mars, Nature, 352, 589-594. ^ Zuber, Maria T., 2007: Planetary Science: Mars at the tipping point, Nature, 447, 785-786. ^ Carr, M. and J. Head III. 2003. Oceans on Mars: An assessment of the observational evidence and possible fate. Journal of Geophysical Research: 108. 5042. 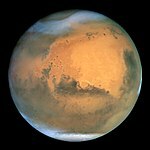 ^ Kerr, Richard A., 2007: Is Mars Looking Drier and Drier for Longer and Longer?, Science, 317, 1673. ^ Carr, M. H. and J.W. Head, 2002: Oceans on Mars: An assessment of the observational evidence and possible fate, Journal of Geophysical Research, 108. ^ Cabrol, N. and E. Grin. 2001. The Evolution of Lacustrine Environments on Mars: Is Mars Only Hydrologically Dormant? Icarus: 149. 291-328. ^ Gulick, V. and V. Baker. 1989. Fluvial valleys and martian palaeoclimates. Nature: 341. 514-516. ^ Boston, P. et al. 1992. On the Possibility of Chemosynthetic Ecosystems in Subsurface Habitats on Mars. Icarus: 95. 300-308. ^ Cowen, R. 2003. Martian Invasion. Science News: 164. 298-300. ^ McKay, C. 1997. Looking for Life on Mars. Astronomy: August. 38-43. ^ Gilichinsky, D. et al. 2007. Microbal Populations in Antarctic Permafrost: Biodiversity, State, Age, and Implication for Astrobiology. Astrobiology: 7. 275-311. ^ Raeburn, P. 1998. Mars. National Geographic Society. Washington, D.C.
^ Allen, C. et al. 2000. Microscopic Physical Biomarkers in Carbonate Hot Springs: Implications in the Search fo Life on Mars. Icarus: 147. 49-67. ^ Huber, R. et al. 1990. Hyperthermophilic archaebacteria within the crater and open-sea plume of erupting Macdonald Seamount. Nature: 345. 179-182. ^ Wallace, D. and C. Sagan. 1979. Evaporation of Ice in Planetary Atmospheres: Ice-Covered Rivers on Mars. Icarus: 39. 385-400. ^ Segura, T. et al. 2002. Environmental Effects of Large Impacts on Mars. Science: 298. 1977-1980. ^ Christensen, P. 2005. The Many Faces of Mars. Scientific American: 293. 32-39. ^ Fairen, A. et al. 2009. Stability against freezing of aqueous solutions on early Mars. Nature: 459. 401-404. ^ Kreslavsky, M. et al. 2006. Periods of Active Permafrost Layer Formation During the Geological History of Mars: Implication for Circum-Polar and Mid-Latitude surface Processes. Planetary and space Science Special Issue on Polar Processes: 56. 266-288. ^ Haberie, et al. 2001. On the possibility of liquid water on present-day Mars. J. Geophysical Research: 106. 23317-23326. ^ APOD: 2005 April 1 - Water on Mars. NASA. [2007-03-29]. - for Mars animation of how Tharsis evolved and affected the amount of water on the planet.